Our rockery is based on the Chelsea Flower Show Gold Medal winning rockery by George Whitelegg and is a bold and modern design statement. 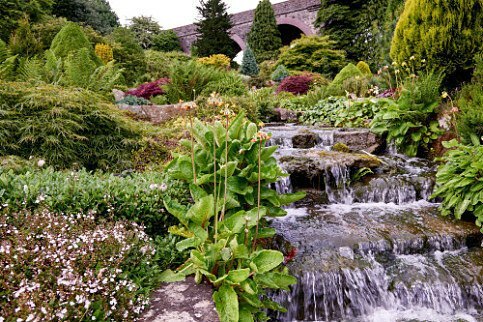 It is a mature rockery built using sandstone boulders from the Forest of Dean to edge a man-made stream and waterfall. Conifers provide the larger geometric blocks, featuring Chamaecyparis pisifera 'Filifera Aurea', mid-green Picea abies 'Albertiana Conica' and the golden columns of Taxus baccata 'Standishii'. Japanese acers show seasonal variation from delicate spring greens to deep autumnal rusts and purples (look out for the burgundy-leafed palmatum dissectum). 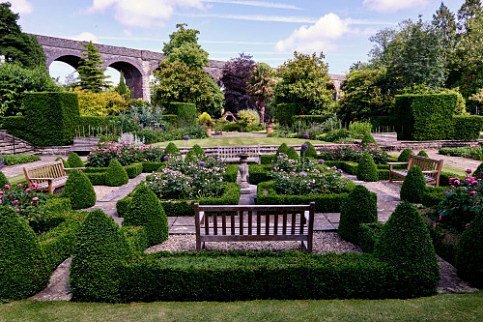 Current owner Roger Saul redesigned the parterre and herbaceous borders in 1996 when he acquired Kilver Court. The parterre is based on the classic French geometric designs found in the Palace des Invalides, and is an immaculate example of low box hedging. The spaces within the hedges are filled with Gertrude Jekyll roses. Juxtaposing the formal parterre are vibrantly coloured herbaceous borders. Fiery Crocosmia 'Lucifer', Phlox, Indigo Hued Polemonium and Aconitum, globe shaped Dahlias and Echinops and delicate orchid-like Tricyrtis Formosana form a sensual backdrop full of texture and shape. We've spent the Springtime working on a very big project . The 100 x 5 metre herbaceous border which sits behind the viaduct had grown way out of control since it was first planted in the 1960s and was in dire need of redirection. 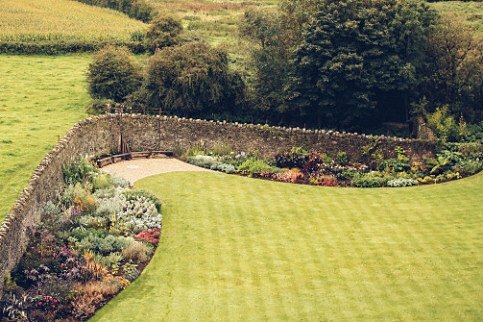 Our gardeners have spent thousands of man-hours derooting, designing and replanting the border based on a unique ‘colourist theory’ which focuses on harnessing the power of colour through design. The foliage is the predominant feature in the new planting scheme, rather than the bloom, with the leaf colour moving seamlessly from gold through to mid greens and dark greens to bronze reds and wine purples, finishing with silver blues and white. Hundreds of interesting plant varieties make up the new border which is open now.